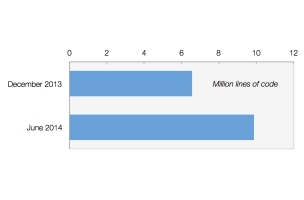 What has 9.9 million lines of code and is free for use by developers? Facebook’s open-source code base. Facebook Head of Open-Source Projects James Pearce offered highlights of the social network’s open-source program from the first six months of 2014 in a post on the Facebook engineering blog. Pearce wrote that Facebook has launched 64 new open-source projects so far in 2014, bringing its total to exactly 200 repositories across the GitHub accounts for Facebook, Instagram, and Parse. He added that there have been 13,000 commits to those repositories, up 45 percent compared with the second half of 2013, and the overall size of the code base has jumped 51 percent in six months, to 9.9 million lines of code. And Pearce said Facebook’s open-source projects have been forked 20,000 times and boast a total of 95,000 followers. Many of our open-source engineering teams are out and about in the coming months. We will be out in force at next month’s OSCON, and we hope to see you there for sessions on Hack & HHVM, the architecture behind React, the Instagram front end, our open-source Android projects, how we run our open-source program, our engineering process, and Open Academy. Today we’re also pre-announcing our @Scale 2014 engineering conference, which we’ll hold in San Francisco Monday, Sept. 15. On the heels of our popular Mobile @Scale and Data @Scale themed events, the conference will comprise a day-long series of deeply technical talks from a variety of leading companies, and focus on mobile, data, and Web development at scale. Like this page and follow our engineering page and open-source updates for forthcoming registration details. We remain committed to a broad and well-balanced open-source program and maintaining a healthy and active relationship with our communities. Whether it’s on GitHub, on IRC, on mailing lists — or in real life at events — we’re excited to work with you. Together we believe we can use open source to push mobile, Web, data, and infrastructure technology forward, and to make all of these developer communities more open and connected. So, um, who wants to commit that 10 millionth line of code?